It’s a sequel that should not be missed! 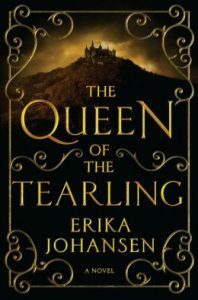 Erika Johansen delivers a dazzling and gripping follow up to her bestselling debut The Queen of the Tearling. Expertly combining modern and medieval themes, Johansen ratchets up suspense as she weaves a magical story that crosses time. In addition, thrilling action spikes addictive anxiety as the story draws nearer to an epic showdown between the Tear and Mort armies. Between the Tear Queen and the Red Queen. The Tear army wasn’t ready for war, but now it was upon them, all the same. 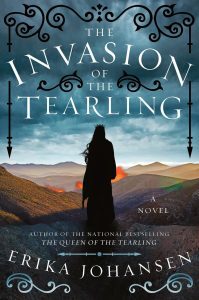 In The Invasion of the Tearling, Queen Kelsea Glynn bravely soldiers on, after infuriating the brutal Red Queen by stopping the slave shipments. Chaos has erupted in the Tearling and Kelsea must quell the tumult and continue to earn respect among her people. But beyond growing into her crown, Kelsea must also figure out how to combat the Mort army, who advances on them with the sharp intent to kill and destroy. We see Kelsea struggle with the dire situation she’s in, see how the pressure begins to affect her. Unknowingly at first, Kelsea begins to change. Emotionally and physically. Her forgettable plainness morphs into a striking beauty. At the same time, however, a caged darkness and fury threatens to consume her. Corruption didn’t happen all at once; it was a gradual, insidious process. Kelsea neither felt nor saw anything occurring, but change had crept up on her back. As the changes take hold and evolves, the Tearling queen also finds herself connected to a woman from another time—Lily. When falling into unexpected fugues, Kelsea finds a kindred connection with this woman who strains against her own, violent confines. Secrets twine around their connection, but as the story continues to unravel, time is running out for her to find the answers she seeks. Written in multiple points of views, Johansen weaves a multifaceted and intriguing narrative. Characters and situations come to life richly and vividly, as a consuming dread invades. Every page, every felled plan, every character and their insidious agendas, bring us closer to how everything will converge when the Red Queen makes a play for Kelsea and her kingdom. Johansen boldly raises the stakes in this fantastically imaginative and thrilling sequel. Magic and madness, sacrifice and greed, hope and resignation, so many gripping themes are explored in one of the most original and well-written series in recent memory. There is one more book to come in the trilogy. Click each image to purchase from Amazon U.S.